Man, so many group projects that need to be turned in tomorrow. This is what happens when it’s a group project that’s not done 24 hours before the due date. Why do group projects need to exist anyway? Why does college ned to exist anyway? 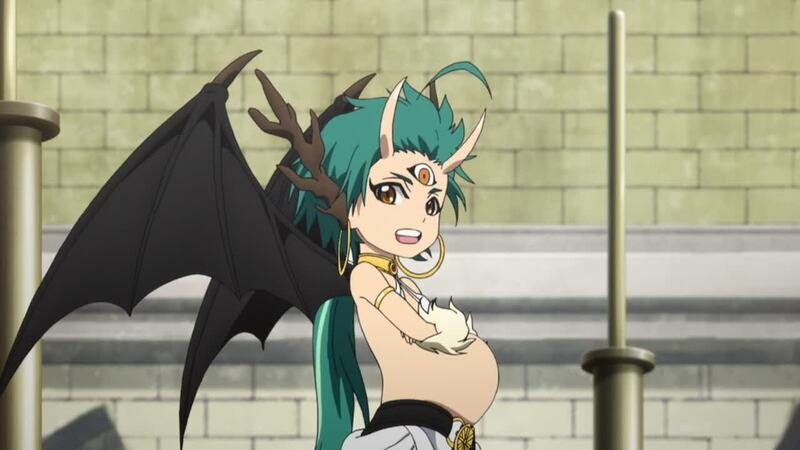 Whatever, it’s Magi time now. It seems that everybody is taking one step further now. Pretty impressive of the characters to mature at such an early stage. 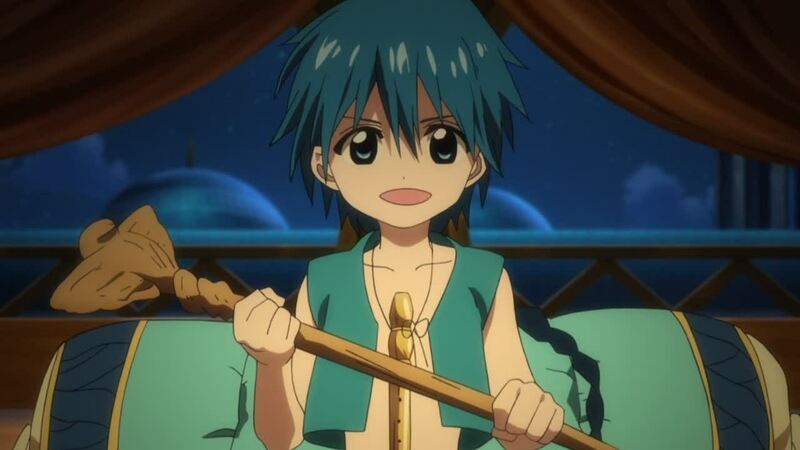 Aladdin refuses Alibaba’s offer to go with him to Magnostadt, knowing that this is not Alibaba’s calling but his.Though Aladdin is just a small kid, he’s the bravest out of all three. He is able to step out of the comfort zone they have in Sindria, willing to risk his own life to a place that’s so foreign and rumored to be so dangerous. His will must be so strong that he’s willing to “abandon” everything just to go to Magnostadt. However, Aladdin’s childish side still can be seen in this episode. Not really a childish side but the lonely part of himself, I guess? One of the people he can relate the most to, Dunya, is dead, and his surrounding (especially Sinbad) is slowly turning into a stranger to him. I also have a feeling that he’s deeply concerned with Magnostadt beyond his duty as a Magi, something more personal than that. Perhaps it has something to do with his world? Whatever it is, it was able to make him feeling at his loneliest as he threw the lily deep into the ocean. The only flower in the ocean, just like him being the only person that’s different from the rest in this current world. If Aladdin is maturing, then Alibaba is always behind step by step. He’s not really going backward, but he’s in a phase where he’s currently stuck in his comfort zone, refusing to leave that place. Why leave when everything is so comfortable? Why do the three of them need to be separated when everything is fine they way they are? Why should he stop following Sinbad when Sinbad is such a “cool” guy? Everything is great!… Until Aladdin decided that he has to go on a journey to “find” himself. From Alibaba’s side, I can see why he refuse to step out from his comfort zone. He is having a great time, and his days are full of joy. Whoever wants to esccape from that happy life must be crazy! Unfortunately, all these “fun” he’s having makes him forget his duties. He has a duty to restore the balance in this world and to revive his now-broken country of Balbadd. He needs to improvise on his Djinn equipment and while getting himself closer to Amon. Aladdin has so many things to do, and yet he’s forgetting all of them. 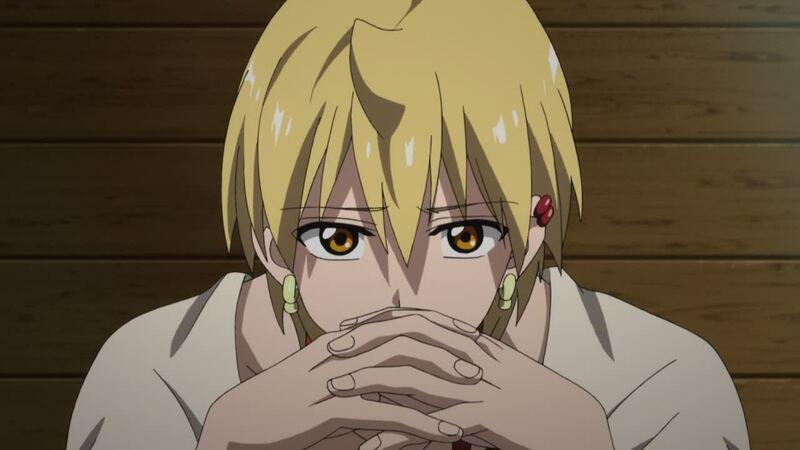 This worries me, because this makes Alibaba an easy target for Sinbad’s manipulation. I hope the show given by Kougyoku will make him realize that he needs to get out from his comfort zone, or else everything will go as Al-Tharmen planned. It’s spring time for Morgiana and Hakuryuu! 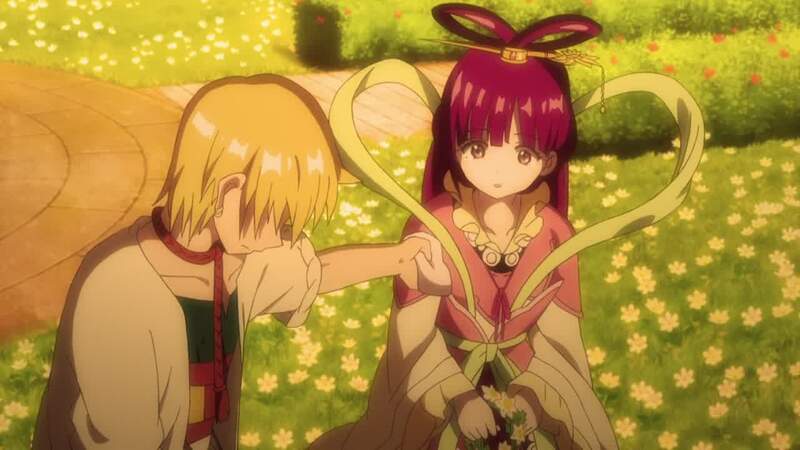 Alibaba and Kougyoku are friends now, but it seems that Morgiana and Hakuryuu are taking it more than friends. At least, that’s how it looks like from Hakuryuu’s side. Whatever it is, it seems that the two of them are becoming more and more intimate, getting to know each other more than just their names and status. God, I am shipping them like mad now. I am preparing my ship for the two of them, but I’m also wondering whether the relationship between the two will work out or not. Hakuryuu and Morgiana are the same and different at the same time. They are the same because both of them have their tragic pasts, and they are able to stand up despite of the hardships they went through. But here is the difference. 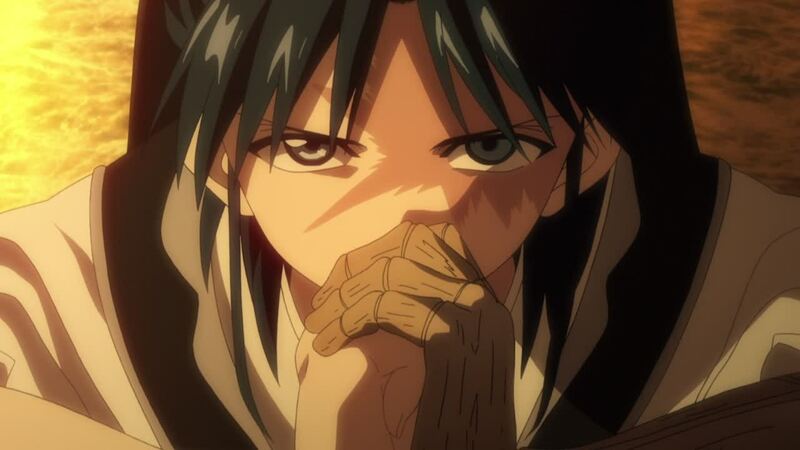 Hakuryuu is stuck with his past, and he refuses to move on with it. 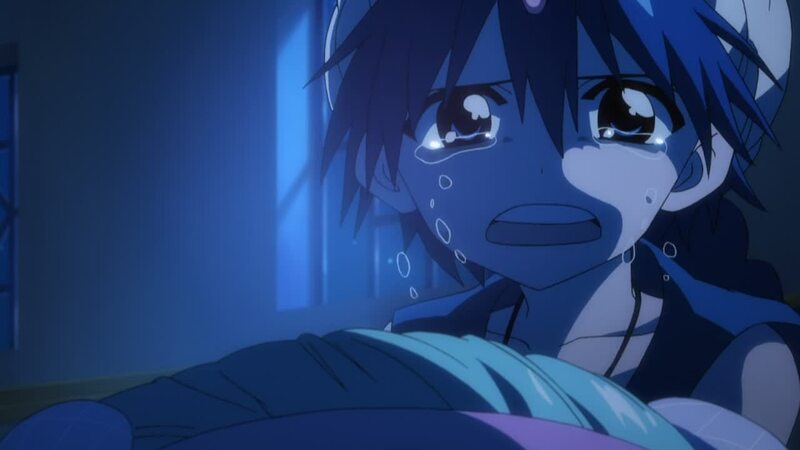 This can be seen when he asked for Sinbad’s aid when he’s taking down Kou Empire – which means, a rebellion. This is for the revenge he has ever since the death of his father – the previous emperor – and his brothers (Hakuryuu not mentioning his mother is intriguing). Morgiana might be searching for her past, but she’s searching for it to get over it. She doesn’t want any revenge whatsoever against those who sold the Fanalis, no. She just wants to go back to her homeland to find peace. 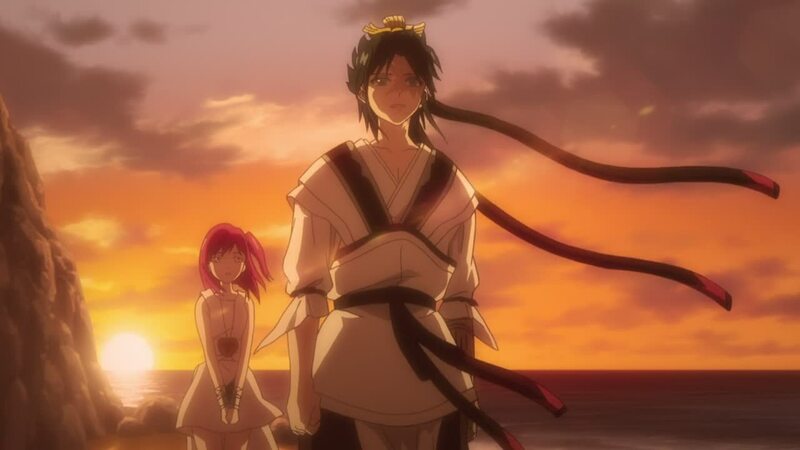 This is the exact opposite of Hakuryuu’s revenge that is reasonable but not good at the same time (there is a hint in the OP for Hakuryuu’s scene. The Rukh turns black when he thrusts his spear). Will it work between the two of them? One can only guess. I’m stopping here because I will write a lot if I continue (I actually want to talk more about Kougyoku, Ja’afar, and Sinbad). The point is, I love this episode. It’s just the second episode, but the episode managed to cover every single important character of this show. I can see each of the character’s current condition, problem, conflict, and resolution. The great thing is, everything happened smoothly without any awkward moment whatsoever. Whoever directed the second episode made a great job at intertwining the characters’ stories to the main plot while exposing the characters at the same time. The manga did cover the characters better, but the anime still did a great job. At least, the gave us all the important information needed for the later arcs. Half an hour passed by and I didn’t even realized it. That’s how engrossing this episode and its content were. It was just fabulous. The animation was also a surprise for me. The first episode was just… Meh. It wasn’t bad, but it wasn’t good either. Decent. 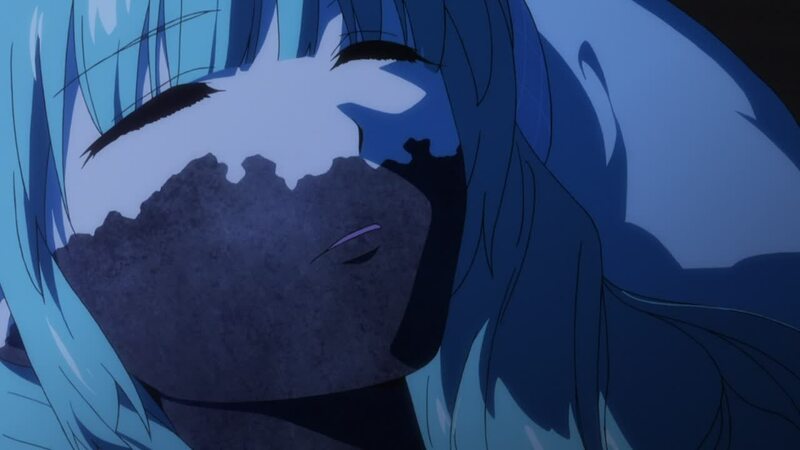 It was also the same for the first half of the episode… Until I see the fight between Sinbad and Kougyoku. Like WHOA, they actually did put more budget in this season. There were definitely more movements, and the movements aren’t that bad either. There was barely any glitch whatsoever, and they didn’t use still images! I wish that the colors are brighter though. At least, make it less dull so I know that they have more budget this season. Anyhow, episode two was great, and the preview of episode caught my interest. I hope the third episode is as good as this one. Preview: It’s time for them to depart, and Alibaba’s nowhere to be seen. Booboo. AHHHHH I’m so excited for the Magnostadt arc~ go get them, Aladdin! …Actually, I never noticed how close Mor’s homeland resembled Africa until this episode. That makes sense …in various ways, I guess. Ah, the budget!! Watching Kougyoku go on a rampage was fun. Oh, how I love insane HanaKana characters. Not that Kougyoku is necessarily insane, but that was not a normal person’s reaction to an intense battle. The fight with Mor was animated really nice as well this episode~. I’m really excited for this season. Hmmmm let’s review Magi’s map. Balbadd & Sinbad’s country is the Middle East, right? Kou Empire is Asia/China, and the Liam(?) Empire is Europe, while Magnostadt is also another Europe. Dark Continent is Africa, and Paltevia is Egypt… I guess? I wonder if there is any representation for North America. I guess it’s nice seeing Kougyoku less annoying for once. She’s actually less annoying now. She’s much more mature than how she was before. A mature yandere, now that’s rare. Incorrect, Balbadd mostly resembles Thailand or maybe ancient Siam (the building structures and royalty dress are indicators). Sindra represents tropical island nations in general (general populaces dress style is an indicator). Kou is indeed China as you state (and the Kouga clan is an obvious reference to the Mongols). The Dark Continent (and Finalis clan) is an obvious reference to Africa, its tribes, and their history. Heliohapt is the country referencing Egypt (come on their garb and building structures, Sharrkan is from there). Reim is referencing the old Roman empire without a doubt. I don’t really know enough about the rest (either in the story or what they are referencing) to place them properly (Magnostada, Paltevia, Artemyura, Sasan, and Imuchakk). Even Jafar is becoming wary of Sinbad’s intimidating charisma and no one can blame him. 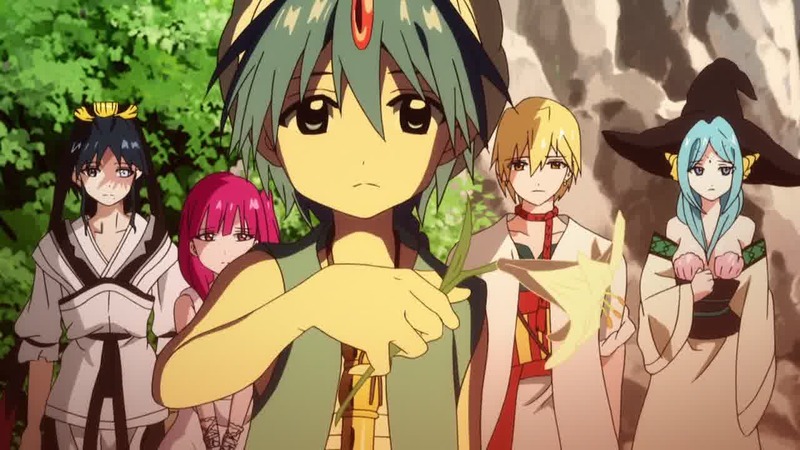 First Monogatari’s Nadeko and now Magi’s Kougyoku. Hanazawa wants to add insanity to her comfort zone and she’s pulling it off nicely. Am I the only person who thinks that Jaa’far will revolt? Maybe I ship Sinbad with Jaa’far too much. What a shame Dunya had to die. Such a beautiful and tragic character. After what happened in the dungeon last season, I hoped she would survive because she was only an unjustly persecuted girl who wanted to avenge her pain. Kougyoku was awesome going berserk. Like Monogatari’s Nadeko, another Hanazawa character who wanted to let loose after being repressed for so long and I loved that “I don’t care about anything anymore” look in her eyes when Sinbad allowed her to go all out. If given the chance, she’d be one unhinged sadist. The difference is that Kougyoku is not as manipulative as HanaZawa. Behind his rude and rought attitude, she really is just a pure girl. It’s nice seeing HanaKana voicing two contradicting characters professionally. Whoever directed the second episode made a great job at intertwining the characters’ stories to the main plot while exposing the characters at the same time. Credit is probably also due to the episode script writer. But you are so right. There was alot lost to me during the last series of this show. 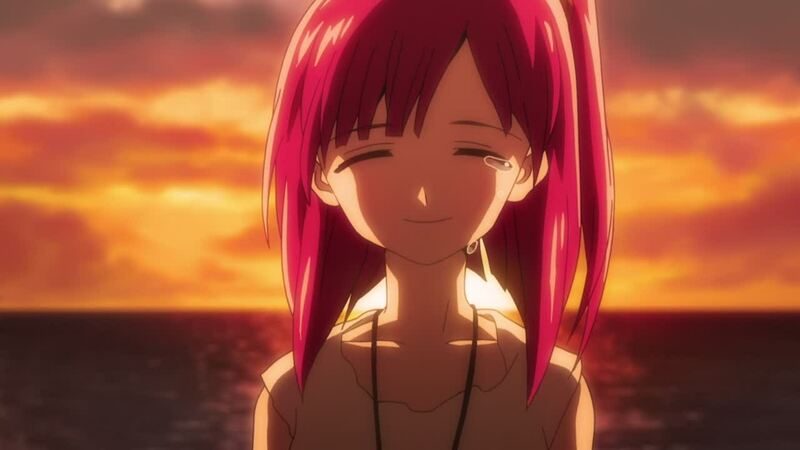 But, this episode managed to buy back a ton of my respect. Everything was just so freekin’ precise. Shipping. Oh, go ahead and ship away, I think we all were. Nothing in these relationships felt hammy or enforced by plotz. It was all very natural. Just some people sharing the feelz and letting it play out as it needed to. Yeah, they brought me back after the continued derp of Balbadd and the not quite Sindaria invasion dungeon stuffs. Rest in Peace Dunya. I cried a bit as well. I suspect the catcher is very picky on “special words” like p0n0s, v0g0n0s, prawns, etc2. It apparently does not like sexting. Phonographs? Vogons? Prawns? I didn’t say any of those things…Why would I sext an anime forum? Why? Why would you sext an anime forum we don’t need to know. The spam catcher detects some dictionary combination of naughty words from what it looks like. I’m a bad boy. But I think the ships in this one is fine.